The questions have haunted humankind for centuries: What happens after we die? What is the nature of heaven and a hell? What is our place in “eternity”? In this startling, funny, compulsively readable, and thought-provoking novel, Michael J. Honig tackles the issues head-on. 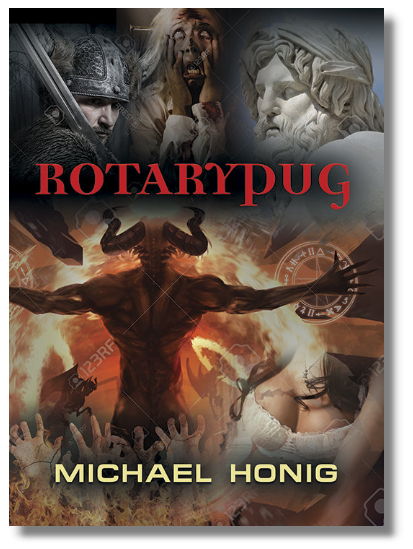 After John Castlemaine’s bizarre “insect-assisted suicide,” he lands in “RotaryPug,” a surreal Purgatory-like realm filled with countless souls awaiting their final judgment—a promotion to heaven or descent into hell. As Castlemaine awaits a very unexpected Judgment, the afterlife brings him face-to-face with an unforgettable cast of volatile, Kafkaesque personalities: a charming Welsh hangman, an ill-tempered Viking bartender, an Ottoman sultan, a sadistic Puritan minister, a vulgar Russian count, a beautiful Victorian courtesan, a rhyming court jester, and—most chilling of all—Satan himself. As his post-life world is buffeted by the winds of debauchery, violence, lust, and treachery, Castlemaine is forced to reevaluate life, nihilism, and the moral value or bankruptcy of his life’s actions . . . as forces beyond his control wrestle with his uncertain fate. MICHAEL J. HONIG of Irvington, New York, is database engineer at a midsize healthcare company in Manhattan. He enjoys reading classical literature, writing poetry, attending Broadway musicals, playing tennis, and hiking in the Catskills. This is his first novel.